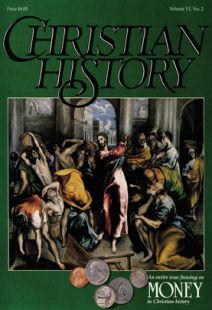 DURING THE FIRST HUNDRED YEARS after the death of the apostles no important Christian writer wrestled with the question of how the followers of Jesus should use their money. The Lord had told his disciples not to worry about it, but to give it away freely. The Jerusalem believers obeyed this injunction by selling their excess property and sharing their goods. Later, Paul’s converts retained private ownership but systematically provided for the needy. Near the end of his life Paul warned Christians against the love of money and instructed wealthy believers to use their money for good deeds. As Christianity spread through all classes of society thoughtful believers must have sensed the apparent tension between Jesus’ injunctions and Paul’s instructions about money. Clement was a late second-century thinker who set himself the task of clarifying the church’s understanding of wealth. His position as the tread of the famous catechetical school in Alexandria made him the most important theologian of his day. He addressed the problem in a sermon on the rich young ruler from Mark 10:17–31, usually known by its Latin title Quis Dives Salvetur? The original is available in Migne’s Patrologia Graeca and appears in English translation in the Ante—Nicene Fathers. Because Clement’s sermon is long and his style verbose, we will present his work in a paraphrased version. The usual way to begin such an essay is with a dedication to a rich patron, but because praise belongs to God alone, and because the rich already have enough temptations to pride, I will forbear. Instead I will tell the rich how to be saved. There are two different mistakes rich people can make about being saved. One is to remember that Jesus said it was easier for a camel to get through a needle’s eye than for a rich man to get into heaven, and then to give up. “Because there is no hope of getting a camel through the needle’s eye,” they say, “I might as well enjoy this life. I have no hope of going to heaven.” The other mistake is to think that it is easy to get into heaven, and thus not to work toward it. Those of us who have true love for rich people will neither insult them nor cringe before them. The wealthy need to know that salvation is neither out of reach nor attained without effort. They should not make the mistake of the athlete who wanted to enter the games, but gave up when he saw the competition. Nor should they make the mistake of the athlete who signed up but did not train properly or eat correctly, so he also lost. To continue the athletic imagery, if one wants to win the crown of immortality, he should let the Word be his trainer, and the New Testament his diet. He must train by keeping the commandments, and remember that Jesus is the referee. If he does this he may be confident that God will crown him with the crown of life. “I have,” the man replied. “Just one more thing,” said Jesus. “If you want to be perfect, sell everything you have, give the money to the poor, and then come, follow me.” Hearing this, the young man went away grieved, because he was very rich. Because Jesus taught with divine and mystic wisdom, it takes diligence and intelligence to find the hidden meaning in his words. In telling the young man to sell his possessions the Savior is not bidding him to abandon his property, but to banish from his soul the wrong ideas he has about wealth—his love of it and his worry about it. Obviously Jesus was not saying that to have no property is to have eternal life. If that were true, then the beggars in the streets, who do not even claim to know God, would be the best Christians. Another reason we know that Jesus did not mean his words literally is that even before Christ came some pagans gave up their wealth, and they certainly were not saved. No, Jesus here is not talking about some simple outward action. Instead, he is speaking of something greater, more God—like, and more perfect: the stripping off of the passions from the soul, and the cutting up by the roots and the casting out of what is alien to the mind. Yes, the pagans could give away their possessions, but they could not free themselves from their passions. I believe that those who did give away all that they had actually intensified the pride they felt in themselves and the contempt they felt for the rest of mankind. If God really wanted Christians to give everything away, why would he have commanded us to feed the hungry and clothe the naked? No, God wants us to use wealth wisely, not to abandon it. Money in itself is neither good nor bad, but we may put it to good or bad uses. If we are to use money wisely, we must get rid of evil desires which cloud our judgment. So let no man destroy wealth; destroy rather the passions of the soul, which are incompatible with the better use of wealth. Become good, and thus make a good use of riches. Hence it is clear that when Jesus spoke of selling all one’s possessions, he meant the renunciation of the passions of the soul. What God wants is a “take it or leave it” attitude about money. Money must not be the master; rather it must be the slave. If one has money, it is for the sake of his brethren; if he does not have money, he is as cheerful as if he had. That is what it means to be poor in spirit. Another way to see that Jesus was speaking metaphorically when he spoke of the difficulty of a rich man getting into heaven is to look at the disciples’ astonished response to his words. “Who then can be saved?” they cry in consternation. Why are they dismayed? Is it because they are rich? No, certainly not. They have left all to follow him. They are amazed because they understand the hidden meaning in the Lord’s words. They have been counting on being saved because they have renounced their possessions, but now they understand that until their souls are cleansed of passions they have no more hope than a rich man who clings to his possessions. Salvation is the privilege only of pure and passionless souls. But the Lord replies, “What is impossible with men is possible with God.” No man can free himself from his passions and desires, but God conspires with willing souls. Peter shows himself willing by saying, “We have left all to follow you.” Here he cannot be boasting of leaving the few dollars worth of property he owned, but he means he has left the old mental possessions and diseases of the soul. By doing this he will be saved. Having shown that it is possible for a rich person to be saved, I will now turn to the one who sees no trouble in riches. You say: “Certainly Christ does not debar me from property. The Lord does not envy.” True enough, but are you overcome and overthrown by your money? Leave it, throw it away, hate, renounce, flee! If you are able to have wealth but to turn from its power, to entertain only modest thoughts about yourself, to exercise self-control, and to seek God alone, well and good. But if not, get rid of it. To you money is an enemy. It vexes your soul with ungodly lusts, strange pleasures, base hopes, and destructive dreams. It makes you grasp for more and more, flogs you on with animal desires, and leads you inexorably to death. A camel has more chance of getting through a needle’s eye than you have of getting into heaven. So instead of thinking the rich have no hope or that they have no problem, learn how to use wealth in order to gain eternal life. First, love God. That means we should treasure him more highly than anything else. Second, love your neighbor, your Christian neighbor. That means give food to the hungry, drink to the thirsty, lodging to the stranger, clothes to the naked, medicine to the sick, and company to the imprisoned. The wealth in your power is not your own, therefore do not wait for Christians in need to ask you for help. Seek them out! As eagerly as a merchant looks for a new market, so should you seek out the needy. And do not ask which Christian is worthy and which is not. You may be wrong in your judgment and thereby deprive someone who needs your help. It is better to take the risk of giving to the undeserving than to take the risk of neglecting the deserving. In giving to these penniless, ragged, ugly, and feeble brothers you are hiring warriors and guards for your soul. One of them can obtain your pardon from God, another can comfort you when sick, a third can pray for you. One of them can teach you about salvation, another can admonish you with confidence, and a third can counsel you with kindness. All can love truly. As a further motivation to give, remember that Jesus gave his all to save us. For each of us he gave his life. Because he gave up his life for us, he demands we give our lives for each other. If we owe our very lives to our brothers, shall we hoard our wealth, and keep it away from them? Shall we keep things away from each other only to have those things burn at the end of the world? No, no! If we do not love our brothers, we are children of the devil and heading for the flames ourselves. But the true Christian loves his brothers! Love seeks not her own, but is diffused on the brother. About the brother love is fluttered, about him she is soberly insane! And, as Paul tells us, love is the only thing that lasts. So you rich one, do not give up hope. God grants forgiveness when we turn to him in repentance. But to make sure your repentance is sincere, submit yourself to some godly Christian who will be your trainer and governor. Let him speak freely to you about your faults, and obey his words. Do not give up. Repentance is always possible. In order to drive the point home that repentance is always possible, let me tell you a true story about the Apostle John. While visiting outside Ephesus one time, John committed a youth to the local bishop to be discipled, and then returned home. The bishop trained the youth well for a while, and then relaxed his discipline. The youth fell in with evil friends, one thing led to another, and the youth finally became the captain of a band of robbers. John returned to the city and asked about the boy. Upon hearing the story he journeyed to the robbers’ hideout and confronted the former disciple. “Come back with me and give yourself up,” John said. “If you are sentenced to death, I will die for you.” Overcome by this great love the man surrendered and was restored to the church, a forgiven brother. Charles Edward White is Assistant Professor of Christian Thought and History at Spring Arbor College in Michigan. He is the author of The Beauty of Holiness.